Recently I released my first decentralized app on the EOS blockchain, King of EOS. This post will talk about the development side of things, go here for more information about the game. It consists of a simple smart contract with about 200 lines of code and a frontend written in React (with next). I won’t talk too much about the frontend, because it’s a standard static site written in React using next. Thinking about it, it’s not that standard - it uses WebGL with Three.js to really visualize the kingdom by rendering castles with custom flags and a randomly generated 3D terrain. To communicate with the blockchain I’m using eosjs. I save the state in the smart contract’s database on the blockchain, and my frontend uses eosjs to read the table of kings and the Hall Of Fame. More interesting is how to let the user interact with my smart contract using the frontend as an interface to the blockchain. The best way to do this right now is by using Scatter. It’s a secure Chrome extension that acts as a wallet. Users import their private keys and the extension injects an API that allows requesting transaction signatures from within my frontend code. Of course, Chrome extensions run in their own sandbox and the private keys never leak to the site. The only way of communication with Scatter is through its injected API. Say, a user wants to become King of EOS and claim the throne: He will click on Claim, fill out his information in a modal, and then my frontend code uses eosjs to build the transaction, and then requests Scatter to sign the transaction. A popup will be shown to the user where he can review the transaction and accept it. // scatter will throw "There is no identity with an account set on your Scatter instance." The backend is a smart contract written in C++ compiled to WebAssembly and then deployed to the EOS blockchain. The usual way to interact with any EOS code is to run your own local node with nodeos that produces the blocks containing the blockchain transactions and run all commands against your node with the cleos CLI. This includes creating accounts on the blockchain, unlocking your wallet, compiling the contracts, deploying the contracts, calling actions on the deployed contract, etc. I’m running the node (nodeos) on Windows through the Linux subsystem for Windows when developing and sometimes it becomes unresponsive, I have to kill it and do the whole process again. Therefore I built a lot of tooling for my workflow. I set up an NPM project and use Node with eosjs instead of the cleos CLI for everything. In the end, I’m just running NPM scripts again, which I and most web developers find really convenient. I can just run npm run deploy to deploy my smart contract to my local node, and then npm run @transfer to run the transfer action on my deployed smart contract. If there’s interest, I could create a scaffolding tool create-eos-app that already sets up an EOS project like this, similar to create-react-app. The smart contract is only about 200 lines of C++ code. There are not many tutorials on EOS development, but once you figure out how it works and read the code of other contracts, it’s pretty easy to write. 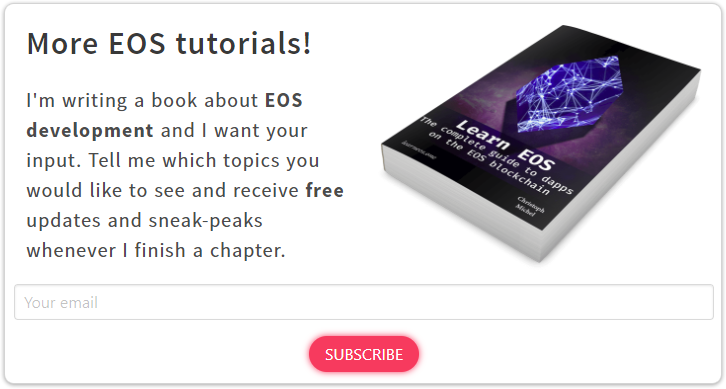 I’m writing a book on EOS full stack development to make it easier for people to get started. The smart contract’s code is available on GitHub if you want to have a look. Each smart contract is tied to a corresponding EOS account that the smart contract is deployed to. This EOS account needs a specific amount of RAM to hold the smart contract’s (webassembly) code and to store the database entries. There’s only a limited amount of RAM available (64GB) and it’s a free market. Meaning, the price is driven by supply and demand and has lately become interesting for speculators that drove the price up a lot. Back then, buying 1 KB of RAM costs 0.32 EOS. The latest price can be checked on eos.feexplorer.io. This means the size of the contract and its database will directly determine how much developers need to pay for smart contracts. How much RAM does an EOS smart contract need? Optimizing structs is hard, but one thing I did was to encode both the current round of the game and the king index in the upper and lower bits of a single uint64_t. Estimating the amount of RAM an EOS smart contract requires is a lot harder and I could only ever check it after I deployed it to the blockchain. The web assembly compiler is smart enough to exclude header files and function definitions that you do not use in your contract. So it comes with Dead Code Elimination. There’s no need to comment out unused header files. Not using std::to_string saves you 188.3 KiB (back then 71 EOS / 500 $). Initially, I used it to print a number in an assert message. Removing it saved me a lot of RAM. Marking functions as inline will usually also shave off some of your contract’s size. I checked som other third-party functions that I could optimize and ended up replacing boost::split’s string splitting function with my own implementation. It reduced the RAM requirements by another 20 KiB. Resulting in a smart contract that needs 200 KiB to be deployed (excluding the dynamic amount of RAM required for storing the entries). Using the EOS resource planner I calculated I need to pay 70 EOS for 220 KiB of RAM. This was about 500$ for a really simple, optimized smart contract. If I didn’t do the optimizations I would have paid double that. Update: The RAM price halfed in the last month. So it would be around 250$ now - but the high volatility of RAM price makes it hard to plan. Comparing this to Ethereum, it’s a lot what developers have to pay and this might hold new developers back from developing on EOS. For indie developers making small fun projects to get started, it’s just too much. I hope this post gave you some insight in how I developed my first EOS dapp and some easy tricks to reduce the amount of RAM your EOS smart contract needs. From a developer point of view, it’s nice to see that RAM has gone down to 0.17 EOS / KB even though it’s still too much for non-profit projects. Some more tooling is definitely needed, running cleos gets annoying. But EOS is only 2 months old, so I expect a lot still to come.